Please join us for this emergency rally to respond to mass ICE arrests. 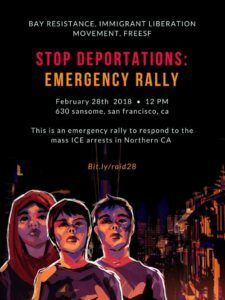 Wednesday 2/28, 12pm at the ICE building, 630 Sansome Street in San Francisco. This rally is being called by Immigrant Liberation Movement, Bay Resistance, California Immigrant Youth Justice Alliance, Free SF and others. Check for updates on the facebook page here. ICE has arrested more than 150 people in Northern California in the past few days. Donald Trump’s deportation force is threatening our neighbors, comrades and loved ones with mass raids. This is political repression against sanctuary cities, which are defending human rights! Are you ready to take a stand against Trump’s naked racism? Join us tomorrow, and bring your friends, coworkers, and family with you.